Broke open a bottle of the coffee version of this today. It's big, there's some alcohol warmth there; it's had three weeks in the bottle and it tastes green. 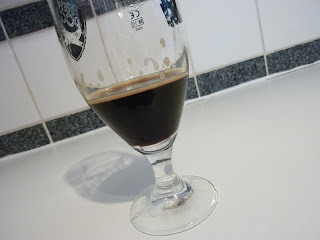 I think I over did the IBUs, underestimated the bitterness that the coffee would add and added too much dark malt. It's bitter, probably too bitter and very dry. It tastes like that flavour you get in your mouth after you've had an espresso. I'm being harsh on myself though (what home brewer isn't!?) because it's actually pretty damn decent. I think it needs some more age on it and, when I brew it again, I'll address the bitterness issues, but the dryness makes it incredibly drinkable and the coffee to dark malt character is beautifully balanced. There's also a real floral quality in the aroma; I can only assume that's coming from the yeast and the coffee.